This delightful recipe has been created to be quick and relatively easy so that it can be made when getting home from work. It works well with either pasta or rice. While prepping ingredients marinate the chicken pieces in 3/4 cup white wine and 1 tbsp olive oil. 1. In a large sized pan set to medium/low, heat 2-3 tbsp olive oil and fry the pancetta. 2. When the pancetta begins to brown add the onions, garlic and optional hot pepper flakes. 3. When the onions begin to turn translucent, remove the chicken from the marinade (same the liquid) and add the chicken strips. 4. Mix fairly often and season with salt and pepper. Toss in the sprig of rosemary. 5. 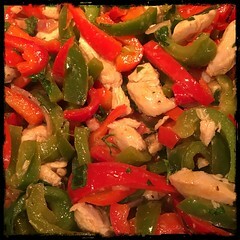 When the chicken become opaque on all sides add the peppers. 6. Mix fairly often and let the peppers soften. 7. When almost ready, remove the spent rosemary sprig and add the reserved marinade. 8. Add the lemon juice and toss in the cut flat-leaf parsley. 9. Serve with pasta and dress with grated Pecorino Romano or Ricotta Salata.